RS Components has selected agency drp for a year-long roadshow series. The series of events was launched with a 35-tonne exhibition truck, which has been travelling the length and breadth of Europe, and will continue throughout the year. The truck is designed to give clients and prospective clients a hands-on experience of the brand's products. Divisions drpexhibition, drpevents, drpvideo and drpdigital have worked together collaboratively to design, create and execute the the moving exhibit. 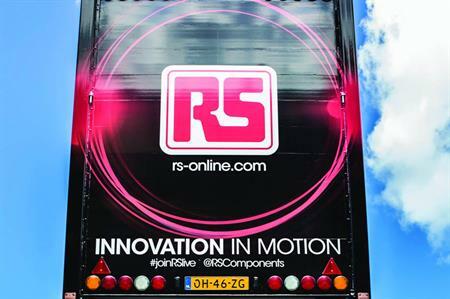 The official opening of the RS Components Truck "It’s On" was hosted in London at the Arc Burlington Danes Academy on the 19 September, and the truck will continue onto to client sites, trade exhibitions, universities, colleges, schools and community events. In total there will be 45 installations of the truck over a 12 month period. James Howarth, head of product management in Northern Europe, RS Compenents, said: "We wanted to put RS on the map – literally – and increase our visibility in the market. We’d like customers to come to us, but we understand it’s hard for them to spare time away from their workplaces, so this truck means we can bring RS to them." The truck was sourced and built in Holland, and the design, art work, and digital content was all developed and produced at drp’s midlands production facilities. Ed Vickery, head of drpexhibition, added: "Technology means an awful lot to us as a business, especially when it comes to innovation and having the all of the right teams working on a solution altogether. The result certainly proved how much we can achieve in a tight timescale and without compromising the overall experience."